So far, I'm still on schedule for a September 30th release of TFS Navajo (book 3). As we get closer to release, I'll provide more frequent updates and send out a newsletter or two. 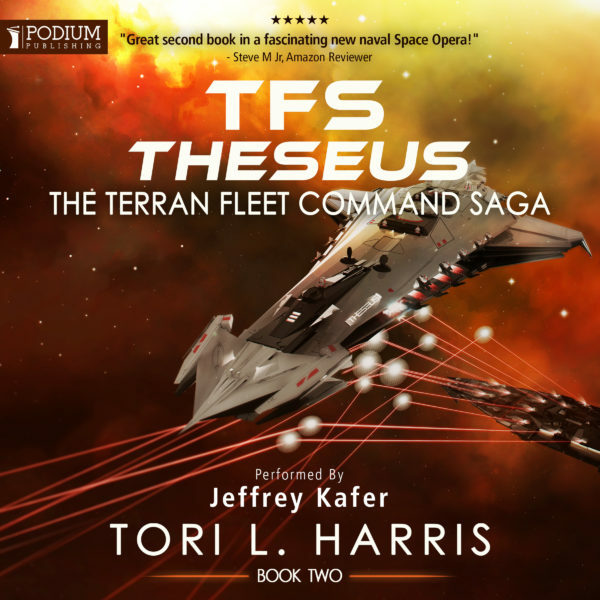 In other news, the audiobook version of TFS Theseus (book 2) should be available for pre-order in mid July. Its release date is currently set for July 26th. Happened across your books a couple weeks ago. I devoured them and am patiently awaiting the next installment. Keep up the good work! Hi Justin! I’m very happy to hear that you are enjoying the story so far. Book 3, TFS Navajo, will finally be “draft complete” by the end of the day today. It has taken me a little longer than I expected, but (so far at least) I don’t think that will impact the release date. TFS Ingenuity is closing in on 500 reviews on Amazon. If you haven’t already done so, I would greatly appreciate a quick review! What I enjoy is the build ups! You know there’s going to be some action but everyghing has to fit in place first! Devoured the first two consecutively on kindle can’t wait for more. Thank you, Andy. Rest assured that there is plenty of action in book 3 that resolves a good bit of that build up you mentioned. Hope you enjoy it! Just finished TFS Thesus … like it very much … this series places you in my best SF writer category … looking forward to the next book in the series. Thank you very much, Larry! It’s always great to hear from readers who are enjoying the story. I’m hoping to finish the rough draft of book three by the end of next week. So far, we’re still on schedule for an end of September release. Fellow writer checking in. It’s good to see someone who takes a couple of precious seconds to let his readers know what’s going on, especially where a continuing series is concerned. Any news on the cover art? Hello, Robert! My cover designer is hard at work on the third cover and we’re hoping to have it finished within the next month or so. I’m always reluctant to release it ahead of time, however, with all the stories of pirated cover art out on KBoards. Hope your books are coming along well! Understood. As for my books, Tony Mandolin 6, The Clone in the Closet is at the publishers, and all new cover art is finished for the entire series, including book 7, which includes a grumpy, late middle-aged Count Dracula. I’m one of those people who did grow up with online games and smartphones and I have to say, your series and one other (silver ships) has kept me waiting for the next books in the series to come out like none other. I can’t wait for your next book, and probably will not sleep until I finish it once it does. Will you put it up for preorder? Haha, well I think that’s pretty impressive, Travis. We Gen Xers had video games too, of course, but they just weren’t all that entertaining. If I had had something like World of Warcraft available when I was in high school and college, I’m really not sure I would have ever graduated, let alone had time for pleasure reading. Thank you, Martin. It’s funny that you would mention having a book keep you up at night. I was just talking about this with someone a few days ago, and I don’t think I’ve experienced much of that since college either. Tom Clancy was the big draw for me in those days (yup, I’m getting old). We all had copies of his books on hold at the local bookstore for release day, then read nonstop until we finished them. I doubt most people who have grown up in the age of online gaming and smartphones can imagine being so excited over a book release, but it was a very big deal at the time. Thanks again and I hope you enjoy the next one even more than the first two!